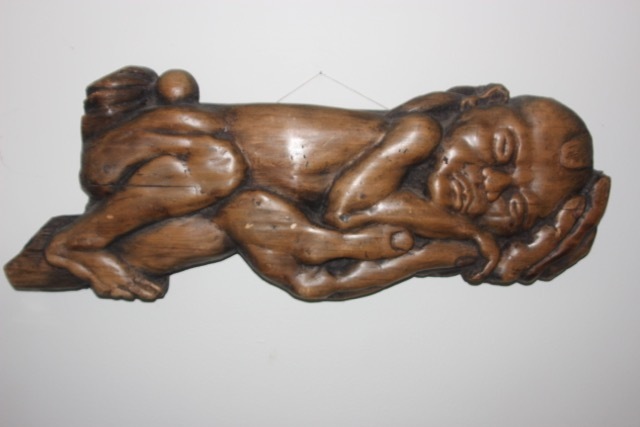 I bought this sculpture in 2007, when I was working as a volunteer in a teachers’ college in southwest China. When I bought this piece, the artist had recently graduated. He was living and working in a very dilapidated and unsanitary house by a river that would overflow during the rainy season. The artist lived there with his wife and his newborn. He sculpted this piece as a memory of the first time he held his son, just a few seconds after the baby was born. At that time, my husband and I had already bought some of his sculptures. Even though I had no children yet, when I saw this tiny baby peacefully resting in strong yet tender hands, I saw the love and beauty that such a moment could inspire. I asked how much he wanted for it. The artist said he didn’t want to sell it because he was too attached to the memory. I came back a few weeks later and saw the artist’s son had developed a terrible rash. The artist and his wife thought it was due to the dampness in the house and they were extremely worried. The artist told me he would agree to sell me the sculpture of the baby if I still wanted it. I said yes. As soon as I paid for it, he gave the money to his wife who rushed their baby to the local hospital. Now I am a mother. When I look at this sculpture I think of them, I think of all the parents, some who live in very difficult conditions, and I see the love and beauty that children can awaken in us. When our first child was born I still remember my husband holding our son in this exact same way.